The following letter from Friedemann Hebart was written after reading Neal Nuske’s article and coming across John Miller’s comments. 1. One sees things somewhat differently today than in 1950, and it is good that it is so. In 1950 there was, as far as I can see, only one ordained Lutheran woman pastor in the world, and that was in Denmark (1948). In Germany during the war, pastors (males) were called up for military service and rather than leave their parishes vacant, the churches arranged for trained woman theologians to take over their duties. When the pastors who survived World War II returned, the women had to relinquish their pastoral role; nobody really questioned that. Perhaps they should have, but as far as I know they didn’t. The first ordination of a woman in the Bavarian Lutheran Church (to which I now belong) was 30 years later in 1975. Even Peter Brunner who wrote the essay on the headship of Christ (“The Office of the Ministry and Women”) – a favourite of the opponents of women’s ordination – wrote it in 1959, possibly as a reaction to the ordination of the first woman pastor in Germany in 1958. His own daughter, incidentally was ordained later. I believe it was against his will. 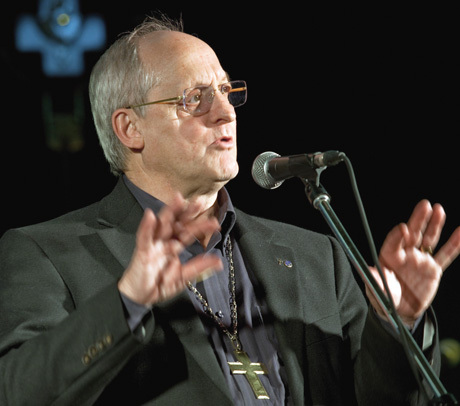 The first ordination of a woman in the then Lutheran Church of America was in 1970, possibly as a result of the hermeneutic arguments of Dr. Krister Stendahl (1921 – 2008; Professor Harvard School of Divinity, 1954-84; Bishop of Stockholm, 1984-88; Harvard 1989; more below!). 2 The question of the ordination of women was therefore virtually non-existent everywhere in the Lutheran Church in 1950, and for some time after that. It wasn’t an issue. I don’t know why the theses on the ministry even dealt with it in 1950. There would have been no difference of opinion at least on this matter in the Intersynodical Committee; I can only assume it was mentioned for the sake of systematic completeness. (Luther for example deals with it in his commentary on 1. Peter – and doesn’t entirely exclude it – although it was entirely unrealistic in his time.) At Immanuel Seminary (as at Concordia Seminary) since the 60′s there were regularly prospective deaconesses studying selected theological subjects. I can’t remember any of them at the time arguing for (or – gasp! – seeking) women’s ordination, or anybody even suggesting that women might be ordained. 3. After I succeeded my father in Systematic Theology at Luther Seminary in 1980, we certainly had what were probably the first women students who desired ordination (and were exceptionally qualified in every way). And when the LCA was founded in 1966 the question of the role of women in the church was certainly already being raised elsewhere. Krister Stendahl’s famous essay, ‘The Bible and the Role of Women. A Case Study in Hermeneutics’, was published in Swedish in 1958, but appeared in English in 1966. I discovered it in a reprint when I returned to Australia from my doctoral studies in Germany in 1973 and was virtually converted on the spot. I remember discussing it with my father at the time and later; the hermeneutic arguments were irrefutable. I don’t know what he taught in Dogmatics between 1971 and his retirement in 1979 at the age of 70, but I knew his hermeneutic principles very well and at that time he was certainly no opponent of the ordination of women, as he told me. 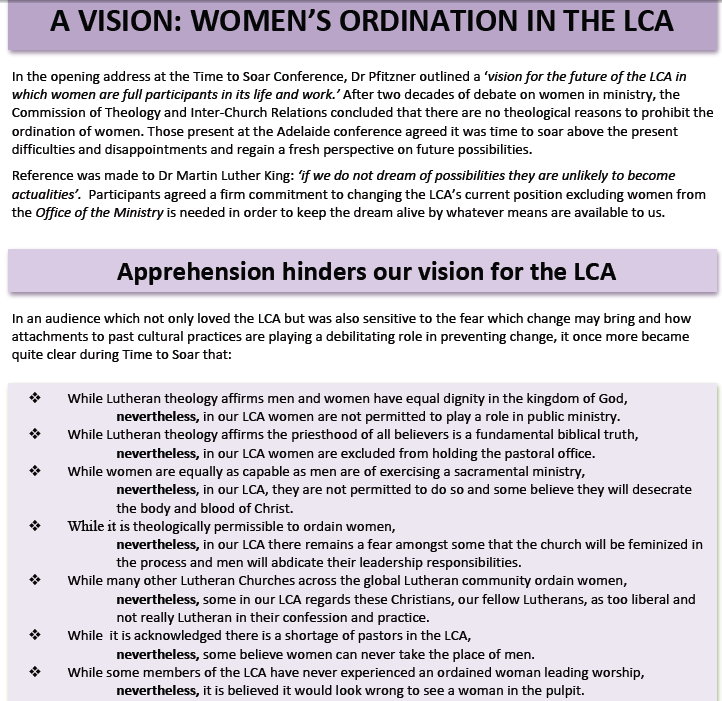 (a) What are your views on the ordination of women? My answer (short form): There are only two statements on the role of women in the ministry which pose difficulties, and we need to look at the context in which those texts of Paul were written. But apart from that; we don’t have doctrines in the Lutheran Church based on two passages of the Bible. [By rhe way, that means that he question of women’s ordination is not a doctrinal issue and therefore does not require a two-thirds majority at Synod!]. (b) The other question dealt with my (suspect) treatment of Law and Gospel in ‘One in the Gospel’ which had just appeared as a book. I passed the colloquium, sort of, and it was decided I could lecture at Luther Seminary as head of the Systematics Department, but not in any ‘sensitive’ theological areas: Justification, Law & Gospel, Church and Ministry, Sacraments, Eschatology. These were to be taught by the new Principal Dr Henry Hamann. I was only allowed to teach Creation and Redemption, Ethics and Philosophy. That was the atmosphere in the early 80′s (until…?). 4. In the light of the above situation in which from 1939 till 1965 it was uncertain what the ultimate outcome of the Intersynodical discussions might be, and from 1966 until (…?) few were prepared to rock the boat for fear that the union might collapse. It is unhistorical and offensive for John Miller to speak of a mysoginistic Blaess/Hebart/Semmler triumvirate; and for him to add that ‘Jesus would vote against Blaess, Hebart and Semmler’ is utterly unacceptable. Statements like this do not serve the cause of WMN in any useful way that I can see. – I can’t speak for the Drs. Blaess and Semmler, but my father was anything but a misogynist. Some of the WMN people may remember that my wife initiated some of the first moves towards women’s ordination in Adelaide in the early 1980s (30 years after the Theses on the Ministry and 15 years after the union of 1965) with e.g. Margaret Mayer, Anne Bartsch and John Sabel and wrote articles e.g. for the student paper of the LSF. There were also meetings in our home first in Highgate, later in Malvern. My father (in retirement) looked benignly on these efforts, my outspoken mother greeted them. In his retirement my father was no longer allowed (!) as emeritus to teach at Luther Seminary: Henry Hamann had the Seminary Council change the rules; he said my father had had a good run and he didn’t want to be Principal in my father’s shadow. So my father taught Dogmatics at the Adelaide College of Divinity for some years and had absolutely no problem training women as pastors for other denominations… So much for his mysoginism. As for Dr. Blaess: my father always spoke most positively of him as one who in his quiet way together with Henry Hamann was instrumental in convincing the more conservative members of the Intersynodical Committee not to look for a heretic under every stone. But in 1950 – 1965 Blaess like the others was a product of his time, and women’s ordination was about as relevant to Australian Lutherans as beaming oneself to the moon. Dr Fred Blaess a mysoginist? We don’t call people bigotted either, simply because they are not actively involved in promoting interreligious dialogue. Sorry this has got a bit long for a blog – but didn’t someone write that it might be interesting to follow up what those naughty people Blaess and Hebart actually did? I hope and pray that John Henderson will find a way to solve the ordination issue as soon as possible. It is for me unthinkable and utterly irresponsible to exclude half of the world’s population from the formal proclamation of the gospel. In 1 Corinthians 14:34-35 Paul speaks about women remaining silent in the church. At this time, Christians still used synagogues for worship. Have any of those who oppose women’s ordination been to a synagogue, or been part of a Jewish bar mitzvah in a synagogue? I suspect not. I found attending a bar mitzvah a very interesting experience, and it explained Paul’s words to the Corinthian women. The synagogue’s “place of worship” and teaching was in the centre front of the ground floor. Here all the men and boys stood together while the rabbi addressed them. There was an upstairs gallery surrounding the sides and back of the building where the women sat, including the boys’ mothers, whose bar mitzvah it was. 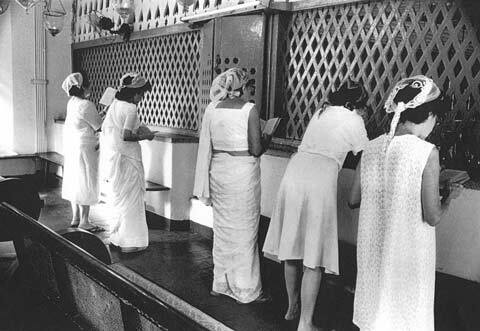 The mothers and the other women were completely segregated from the men and none of them understood, including the mothers of the boys, what was happening with their sons, or what they were being told because it was virtually impossible to hear what the Rabbi was saying to the men. The women were bored so they started chatting amongst themselves. But the talking and then laughing became increasingly louder, and was starting to intrude on the service below. The Rabbi suddenly stopped talking, turned around and looked upstairs to the women, and commanded them to stop making a noise. The women became silent for a short time, then through boredom, started to chatter again. They were reprimanded by the Rabbi 3 times during this bar mitzvah which I attended. Suddenly it dawned on me – this is what the apostle Paul was talking about! The women were not an integral part of the service – it was for men only – and this would have been the custom in the early church. Of course it would have been disruptive if these isolated women tried to call out or say anything. When we got back to the host family, we women had to ask the father what was being said. If any woman had called out for an explanation of the events, of course it would have been disruptive! So now, because some Christians don’t understand the Jewish customs or culture, they read words at face value in the Bible without understanding, and then stand against women’s ordination in the Lutheran church – using this scripture to say Paul forbade women to speak in church – without understanding why he said it. 1 John 4:18 tells us: “Perfect love casts out fear.” Why then are some Lutherans showing fear of women’s ordination? Why are they trying to hinder the preaching of the Gospel? May the love of those in the Lutheran Church who favour women’s ordination grow and spread into the hearts of those who appear to be putting ‘law before grace’ and are hurting the Lutheran church and the spread of Christ’s love to the lost. 1 Corinthians:7 “Love bears all things, believes all things, hopes all things, endures all things.” God is love.